[値下げ] Black Hole | Mac App Storeのアプリ検索・ランキング BuzzMac! 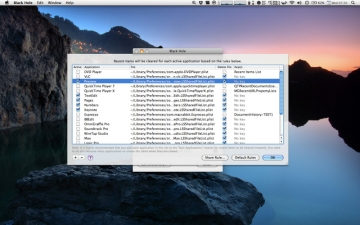 Black Hole is a powerful application that allows you to clear sensitive information from your Mac with a single click. Black Hole automates many operations such as quitting applications, removing recent items from application menus, emptying the Trash, and more. More time for you! • Quitting Applications : Black Hole can quit any number of applications with a single click on the "Clean" button. If an application fails to quit after a set amount of time, Black Hole can force quit it for you. • Clearing Recent Items : Using this option you can clear recent items from the File > Open Recent menu of most applications. Black Hole comes with a default set of rules, or you can create your own. • Emptying the Trash : Emptying the trash is a matter of seconds, even if the files inside it are locked. 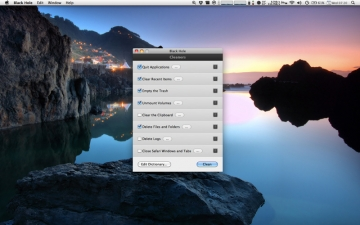 • Unmounting Volumes : Black Hole is able to unmount volumes from your Mac, be it a Mac or Windows share, a USB key, an external hard drive, or a mounted disk image file (.dmg and others). This can be very useful if you store confidential information in encrypted disk images, for example. • Clearing the Clipboard : The clipboard can be cleared without question or only if some keywords are found within it. • Deleting Files and Folders : Black Hole can delete files and folders for you, bypassing the Trash. There are several options for configuring exactly what files to remove according to your needs. • Deleting Logs : It's easy to delete log files using Black Hole. No need to hunt for them. You can easily mark log files and folders for deletion and have them removed each time you start the cleanup. • Closing Safari Tabs and Windows : Safari tabs and windows can be closed without question, or only if their titles contain one or more keyword(s). • Secure Deletion : Black Hole supports deleting files securely using three standard algorithms that provide a good balance between speed and security. Note: This app is available for free on my website, www.irradiated.net. You could consider purchasing the app a donation that will truly encourage the development of this app and the other apps I make. For less than the price of a coffee you help me afford publishing my apps on the App Store. It is also possible for you to download the app for free on my website and make a donation and/or purchase it in the App Store afterwards if you are satisfied with it. To be able to purchase the app in the App Store after installing the free version, you need to trash the free version. Only then will the "Installed" button revert to a "buy" button in the App Store. Steve_Mac_NS (Steve MacArthur)@AntiAntEye @MarkusDAtl Ender is a black hole and I am not sure Dansby has hit anything since he was unstoppable and then they moved him up.